Of all the forms of dance music, techno is probably the most misunderstood. It’s the difficult middle brother of universally accepted house music; its immaculate basslines are the obsessive compulsive aunt to the wild energy of drum’n’bass; and for non-fans of electronic music, techno is the blanket term for all of it. 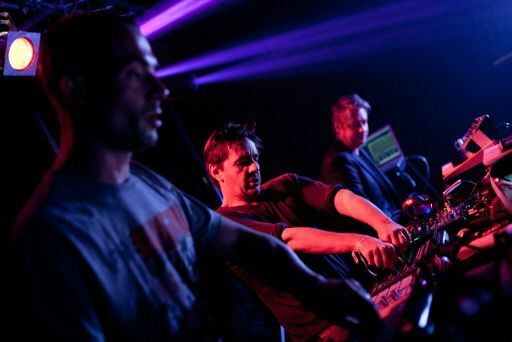 That’s why people like DJ-producer and scene stalwart Laurent Garnier need to keep making music. He’s the techno DJ that plays techno about half the time – and if you check out his albums, you’d assume he’s not a techno producer at all. LBS is a five hour set with each track averaging about 20 minutes; 35 minutes isn’t unusual either. Records are sampled and mixed with live renditions of Garnier’s own tracks played by all three members, for a show that’s different every night. Like Garnier’s own albums, LBS isn’t the purist’s definition of techno – but then again, that’s exactly what Garnier shies away from. Instead, it warms the form with jazz, funk, and hip-hop for a lush, organic sound that successfully jams members of the brass family with their electronic cousins. Take 2005’s Cloud Making Machine, an introspective, cinematic soundscape that is a dark contrast to his most recent album, Tales of a Kleptomaniac, a funk-infused piece that stops off at dubstep, drum’n’bass, and ambient electronica before heading back to the jazzy techno Garnier is known for. “That’s when Djing changed a bit, got more colourful. Eight years later, I’m so happy I did it.’ Garnier speaks confidently and quickly with a French accent that’s survived his years in England, DJ-ing in Manchester’s burgeoning house scene. At 14, he was already obsessed with music and clubs, and four years later, moved from hometown Paris to London. When he chanced upon Manchester’s infamous Hacienda club, he started playing there and was instrumental in the ‘Madchester’ movement where such iconic bands like the Stone Roses and Happy Mondays mixed psychedelic rock with the Chicago house and Detroit techno that was seeping into Britain. Towards his own productions, he has a similar fire, and every bedroom DJ with a demo to push knows the Laurent Garnier story where he listens to every single track he gets sent. “I’m sent 1,500 tracks a week, plus stuff I get myself. I spend my whole life on music. I insist because finding the right record is the essence of my job,” he says matter of factly. If house music is the gateway drug, techno is the last frontier; the final form of electronic music generally accepted by mainstream fans, save perhaps dubstep, the organ-shaking, bass-driven sonic implosion that is Garnier’s latest muse. “Dubstep is one of the most inspiring styles of music for me at the moment. I always said, our goal is to make techno music grow,” he says. ← Windows Phone 7: say no to apps?